Sometimes they just want to eat something quick, sometimes they just want to eat something that will require the least possible effort. People will offer lots of reasons for why they don’t want to have to think about cooking, but usually what it comes down to is that they just want to refuel. Busy modern lifestyles and ubiquitous convenience foods have discouraged people from taking the time to cook fresh food for themselves. The pattern of ‘eating to live’ rather than ‘living to eat’ reduces cooking to a chore that has to be got out of the way before the important eating part can begin. Frozen ready-meals and microwaves have made it possible to put dinner in front of a whole family with little more than a few moments of attention. Beyond serving temperature, these offer no opportunity or necessity for the cook to contribute to any aspect of the preparation of the food. The idea that cooking is a social, experimental, private, creative, technical live performance art that should command the enthusiasm of the entire household often goes largely unrecognised. A lot of people are intimidated by what they perceive as the artistic demands of cooking, a fear which is reinforced by obstreperous celebrity chefs and pretentious foodies but which could not be less appropriate. Producing a good dish has more in common with crafting a good chair than it does with painting a Mona Lisa. To qualify as a good chair, a chair must simply be good to sit on. To qualify as a good dish, a dish must simply be good to eat. A great meal is like a particularly fine set of furniture; high-quality raw materials in artful combination worked with precise attention to detail and technical skill, each piece of the set complementing aspects of the others. It’s rarely worth the time and effort to fashion an elaborate and uncomfortable jewel-encrusted throne. In fact, embarking on any cooking project with a groundbreaking masterpiece in mind is almost certain doom. If instead you take the time to get to know the potential of the ingredients and techniques that are already at your disposal, it’s possible to reliably turn out perfectly good tucker every time you take to the kitchen. Recipes are another thing that can scare people away from the kitchen. The thing to remember is that (except when it comes to baking) most recipes should be seen as a rough template not a strict set of rules. A specific recipe can be a good starting point for learning to cook with a particular set of ingredients but too many people just learn one or two recipes they like and repeat them religiously with no deviation from the blueprint, never suspecting the potential cornucopia of diverse delights waiting just round the corner. People have been cutting food up and treating it with fire for tens of thousands of years. There is a huge accumulated wealth of knowledge out there, the result of millennia of experimentation and repetition. Pretty much anything that can be cooked has been cooked, or at least been tried. If two ingredients don’t often show up together in a dish there is usually a good reason, though not always. Cooking for fun means being confident enough to experiment with variations on existing recipes and the only way to gain that confidence is through trial and error. Embracing constructive criticism as crucial feedback rather than rejecting it is also essential for learning how to cook for others. 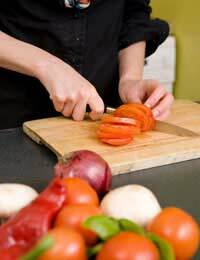 At one level, cooking is the transformation of raw, unprocessed bits of nature into edible, if not delectable, food. Through treatment with heat or cold, with knife or mixer the cooking process alters the physical and sometimes chemical properties of the ingredients and weaves them together into something new and tasty. Alchemy does not seem so fantastic set beside a perfectly poached egg or a spiral of spun sugar. By not cooking you deny yourself the opportunity to hear the music of hot pans crackling and sizzling as red wine deglazes them. You never learn the easy way to chop anything or how to judge by eye the flavour payload of your garlic. You miss out on the crispest, most verdant greens and the intoxicating aromas produced by any spicy cuisine. Cooking fresh food is not simply the healthiest way to eat. It effortlessly teaches greater understanding of the ingredients being used in order to make the most of them and it provides a daily opportunity for creativity, improvisation and inspiration whether social or solitary. Every attempt at a dish should strive for perfection and every dish starts out with the potential to achieve it. Perfection, of course, being a very subjective thing.